And I just got one. It's the Koobface worm, it says here: Koobface Re-Activated! and here, and here, and here, and other places, no doubt. That's it. There is usually quite a bit more stuff in one of these message notifications. When I took a look at Facebook, I saw the message in my inbox, but by that time, I knew not to click it. Clicking the url takes you to a screen with Facebook-like fonts and colors that says "Leaving Facebook ... Never use your Facebook password outside of the Facebook site." (That's a paraphrase, I'm not going back there to look at it again.) It then goes to something that looks like YouTube. If you're quick you can see that it actually says YuoTube at the top of the screen. It then tells you you need Flash version 10.37, and the download starts right away. Apparently the thing affects both the computer of the victim, and his or her profile. Trend Micro has a chart of the botnet, or parts of one of them, anyway. Update: Morgan Freeberg links, and has quite a bit more to say, particularly about those apps that seem so cute. Concord, April 19, 1775; statewide, February 19, 2010. Almost 235 years between revolutions begun in Massachusetts. 85,743 days, if you like. Well done, Scott Brown! Well done, Massachusetts voters! Gerard van der Leun is pleased. (Mind the Nazis at the first link.) So am I. Now, to carry it on. Not even close. And it's Mass. And it's Kennedy's old seat. And Kennedy pushed for changing the rules to fill the seat. The whole thing is delicious. I wish I could bake it into a cake and eat it. Before you get all up in my face 'bout what I'm 'bout to ramble on about, lemme first say that I know the human memory tends to heavily discriminate the stuff it stores, cataloguing things the way it wants to and reserving special places for certain select events, sounds, sights, smells, and scenes. And not only does it selectively edit things in and out, but it tends to embellish events with its individualized set of filters, ethics, morals, priorities, and tastes, magnifying some episodes and minimizing others. Read the whole thing for comparisons of the Navy of fifty years ago with the Navy of today. Via Glenn Reynolds, who says, "Nostalgia aside, though, the new Navy seems awfully good at its job." Andrew Revkin put up a short post at Dot Earth on the collision between a Japanese whaler and a Sea Shepherd speedboat. It has garnered over 200 comments at this posting, many of them illuminating. Speaking of illumination, what are the Sea Shepherds doing with these green lasers? Revkin seems to think that the Japanese ship was responsible for the collision. Some commenters wiser in the ways of the sea have endeavored to, ah, illuminate his thinking, but the main post still says "Sea Shepherd has released video from a distant vantage point that clearly shows the Japanese ship veering to starboard to close with the smaller protest craft." 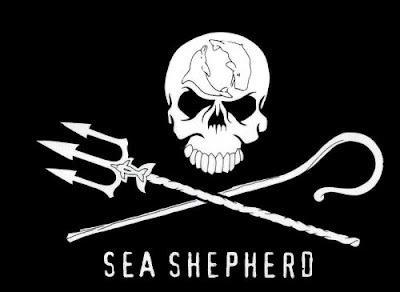 Here's a video of a Sea Shepherd ship veering to starboard to close with another craft. What are they doing? Trying to capsize it? That video comes from Sea Shepherd. They are proud of that. Sea Shepherd's tactics are reprehensible and criminal. But what could one expect from a group that uses this as an emblem? I don't like whaling, but I like Paul Watson (and by extension his group, Sea Shepherd) even less. "We need to radically and intelligently reduce human populations to fewer than one billion." That's going to leave a lot of corpses. A newish site on the subject: Lies of the Sea Shepherd. At The New Yorker: Street Fight on the High Seas. The comments are better than the article, which is mostly an interview with Watson. Now the IRS wants to make tax preparation services more expensive, by requiring licensing and continuing education for preparers. Update (via Reynolds): IRS Commissioner Does Not Do His Own Taxes Because of Complexity of Code. It was killed by Democrats in Congress, according to this report at BigGovernment. James Delingpole says, "If any of your idiot friends still believe in AGW, make them read this letter." Then he quotes some high points. The whole thing is at Watts Up With That. Good luck with the part about making them read it. Kevin Dunbar is a researcher who studies how scientists study things -- how they fail and succeed. In the early 1990s, he began an unprecedented research project: observing four biochemistry labs at Stanford University. ... Dunbar brought tape recorders into meeting rooms and loitered in the hallway; he read grant proposals and the rough drafts of papers; he peeked at notebooks, attended lab meetings, and videotaped interview after interview. He spent four years analyzing the data. "I'm not sure I appreciated what I was getting myself into," Dunbar says. "I asked for complete access, and I got it. But there was just so much to keep track of." Dunbar came away from his in vivo studies with an unsettling insight: Science is a deeply frustrating pursuit. Although the researchers were mostly using established techniques, more than 50 percent of their data was unexpected. (In some labs, the figure exceeded 75 percent.) "The scientists had these elaborate theories about what was supposed to happen," Dunbar says. "But the results kept contradicting their theories. It wasn't uncommon for someone to spend a month on a project and then just discard all their data because the data didn't make sense." You really need to read the rest, because it provides a fascinating insight into the frustrations encountered by research scientists on a regular basis. I spent the better part of a decade working in a testing and analysis laboratory. We never did "pure research" -- all of our work was based on well-known analysis methods and verified by standard quality control procedures. Still, we occasionally had to re-do entire sets of tests if our quality controls indicated errors. Researchers can sometimes trace unexplained results back to commonly encountered problems with laboratory equipment, reagents, or calibration standards, but many times there is no clear understanding of why the results of carefully planned experiments end up being "wrong." The Instapundit reader who emailed this story to Glenn Reynolds wryly noted, "Wired Magazine unknowingly explains Climategate." How true. As I have previously noted, the ClimateGate scientists, most notably Michael Mann and Phil Jones, seem to have fallen prey to the temptations of celebrity recognition and unlimited research funding that are promised by those in power when scientific research seems to be producing the "right" answers. Mann, Jones, et. al. undoubtedly believed that they were on to something significant, but chose to disregard objectivity when confronted with the fact that much of their research data apparently resided in that damnable 50% - 75% category of errant or unexpected results. I have donated. Keep up with events at Le·gal In·sur·rec·tion and Sisu. Science has long known that some components of our DNA are relics of viruses that entered into our genome in some past infection. However, no one ever thought that virus remnants formed this much of our genome, or that one of the viruses might lead to disease, let alone something as complex as mental illness. Sorting through the junk will pay off, as we learn to distinguish between trash and treasures. Next step, still a long way off: the clean-up. Update: More on the schizophrenia virus: "Our DNA carries dozens of copies of Perron’s virus, now called human endogenous retrovirus W, or HERV-W, at specific addresses on chromosomes 6 and 7." John Williams of Shadow Government Statistics calculates that using Generally Accepted Accounting Principles as public corporations do, the total 2009 budget deficit would be roughly $8.8 trillion, not the $1.4 trillion reported on a cash basis. Disambiguation: Walter J. "John" Williams of Shadow Stats is not Walter E. Williams of George Mason University.